I spent alot of time creating a spreadsheet that is linked via DDE to a data provider. Everything was working great last night. Closed the computer, woke up this morning and tried to reopen it. 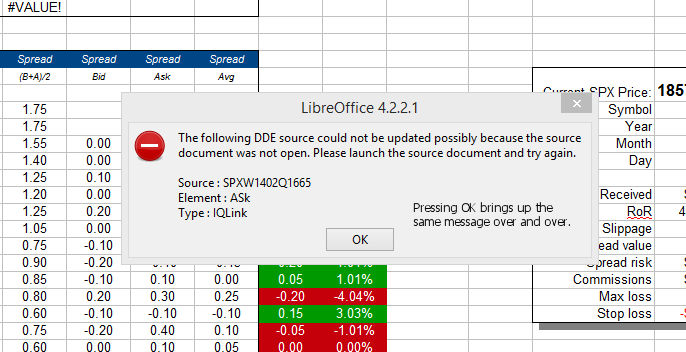 When Calc opens the file, it seems to be looking for data from my data provider via the DDE function they provide. Since I make alot of calls to that function, it seems to crash down the whole Calc program everytime... to the point where I have to shut down Calc via the task manager everytime. I read somewhere can resetting my user folder would help but it did not help at all. Help! What can I do? Is there a setting I need to tweak somewhere? That file opens perfectly fine for me if I choose not to update the linked data. (LibO 4.2.0.2 on Ubuntu).